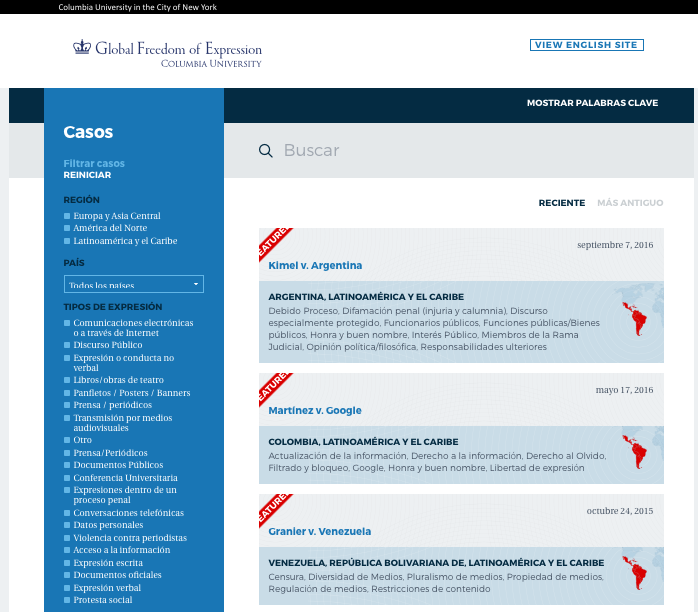 Judicial decisions on freedom of expression and access to information of the highest courts of 16 Latin American countries are available for free consultation now that the Freedom of Expression Case Law online database in Spanish is available. Banco de Jurisprudencia sobre libertad de expresión. Captura de pantalla. The database was developed by the Global Freedom of Expression project at Columbia University in New York in collaboration with Unesco and Dejusticia. The Foundation for Press Freedom (FLIP for its acronym in Spanish) of Colombia and the Universidad Externado of Colombia also collaborated in the process of analyzing the judgments. “This initiative demonstrates the importance of creating multi-stakeholder synergies in support of protecting freedom of expression in the region,” said Lidia Brito, regional director of Unesco in Montevideo, according to a press release. A group of Colombian lawyers was elected to do the analysis of the judgments. The group was under the supervision of Catalina Botero Marino, international human rights lawyer and former Special Rapporteur for Freedom of Expression of the Inter-American Commission on Human Rights (CIDH). The development of this database was possible after several consultations with judges from Latin America in the context of a Unesco project that seeks to "strengthen the legal protection of freedom of expression on the continent," the statement said. Finally, in April 2016 during the Ibero-American Summit of Judges held in Paraguay, 23 heads of Latin American courts supported this database in Spanish through the exchange of knowledge and jurisprudence. In 2014, Columbia University created the Global Freedom of Expression project in order to "advance understanding of the norms and institutions that best protect the free flow of information and expression," according to its mission. Among other activities, the project carries out research commissions, public policy projects, organizes conferences, etc. “Columbia Global Freedom of Expression is delighted by the opportunity to work with Latin American partners to launch this fantastic tool and resource,” said Agnes Callamard, director of the Global Freedom of Expression project, according to the release. Among the more prominent cases is one of the most recent decisions of the Inter-American Court of Human Rights (IACHR) related to the channel RCTV in Venezuela. The Court ruled that the Venezuelan State violated the right to freedom of expression of the journalists and directors of RCTV when it did not renew RCTV's license based on discriminatory criteria. It also highlighted the Inter-American Court’s decision in the case of journalist and historian Eduardo Kimel who had been criminally convicted by the Argentine government after writing a book criticizing the performance of a judge in charge of investigating a massacre during the country’s military dictatorship. For the Inter American Court, the State abused its power when it imposed a penalty of one year in prison and a high fine on the journalist for the crime of calumnia (defamation).